What is Escape: the Curse of the Temple? Escape: the Curse of the Temple is a family adventure game that was designed by Kristian Amundsen Østby and published by Queen Games. As explorers in a cursed temple, you have 10 minutes – counted down for you by a provided soundtrack – to explore the temple, find gems, discover the exit and get everyone out alive. If even one person is left behind, everyone has lost the game. 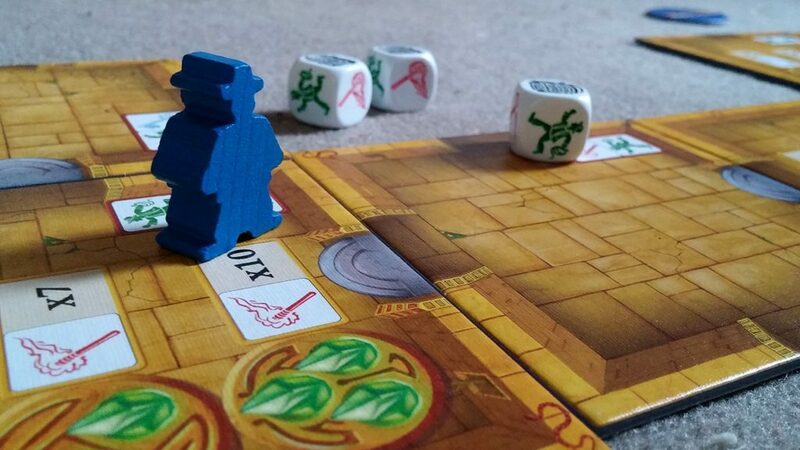 In Escape: the Curse of the Temple, every player gets 5 dice of the color of their explorer. You must roll the dice to enter rooms, collect gems and help out your fellow explorers. All explorers start on the beginning tile, with only two others visible. As you roll and move through rooms – matching dice to the symbols in those rooms – new tiles are placed and the board builds itself as you go. When you enter a room that has gems, you must roll a certain combination of symbols to collect them. When you finally find the exit, you and all your fellow explorers together must roll however many gems have NOT been collected. The real trick to Escape: The Curse of the Temple comes in its time constraints. Where most games are played in turns, Escape is played all at once, everyone moving independently, at the same time. A creepy soundtrack will be playing throughout the game. A gong sounds a third of the way through, telling you to either make it back to the first room or lose one of your dice for the rest of the game. This gong happens two more times until there is a final count down for all of the explorers to get out of the temple before it collapses. If anyone is unable to escape within 10 minutes, all players lose the game. If you ever wanted Indiana Jones in a box, Escape: The Curse of the Temple might just be the perfect game for you. The artwork on the tiles and the soundtrack make it very easy to feel like you have to get out of this temple as quickly as you possibly can. The theme probably wouldn’t be very strong without the soundtrack, but with it it’s as thematic as a tile-laying game can be. Escape: The Curse of the Temple is a fantastic dice exploration game (or diceploration, if you want to go there). Its mechanics are well designed and laid out in an easy-to-understand way, which makes this an excellent family board game. There are a couple of other co-op games out there that have players take their turns simultaneously, but not too many of them are as smooth as Escape. You do have a lot to think about as you are rolling your dice and moving, but it’s also pretty easy to recognize when you should be helping yourself and when you should be helping your teammates. We’re always fans of games that allow you to lower or ratchet up the difficulty, and you can easily do that in Escape. All you have to do is add or remove certain tiles to make the game easier or more difficult. As is the case with any short game, Escape: The Curse of the Temple does lack depth. Those who are looking for deeper, more strategic games will want to get another cooperative game. Of course, Escape isn’t aiming to be one of those types of games, so it is hard to hold that against it. 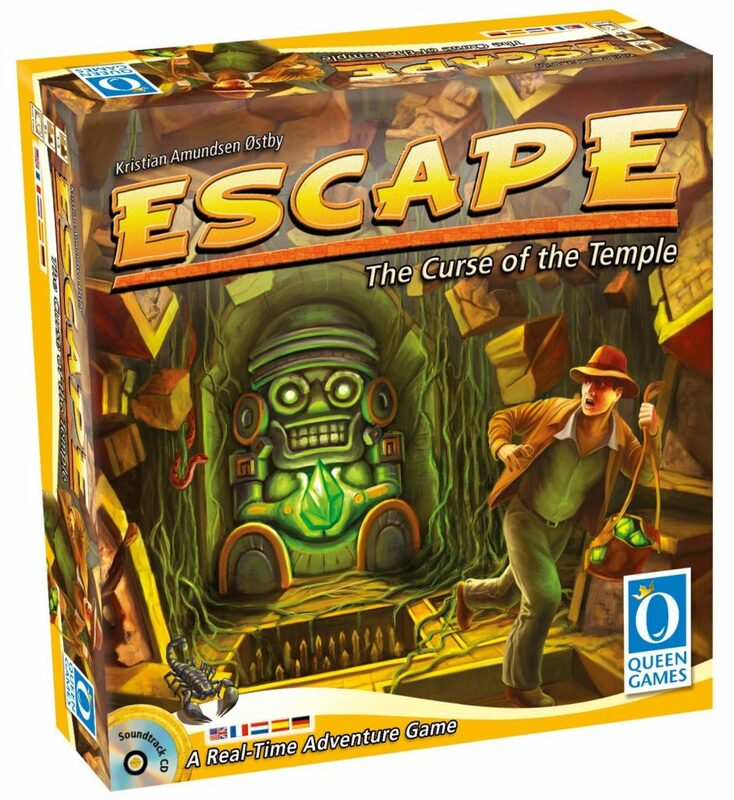 Escape: The Curse of the Temple is a fantastic family game that will get people of all ages interested and involved in the action. Anyone who is looking for a quick little adventure game with tons of tension will want to check this one out. Even though there are other cooperative board games that we like a bit more than Escape, it will definitely be staying in our collection since it is one of our favorite fillers and one of the top family games out there. We also rank it pretty high in the top two-player board games category. After many, MANY games, we don’t play Escape too much as a group anymore, but there were multiple occasions where we played it five or more times because we were having such a good time and really wanted to beat it. Thanks for taking the time to read our Escape: The Curse of the Temple review!